Home > education > Mr. Kazuki Yokosawa wins Katsuyoshi Watanabe memorial award. 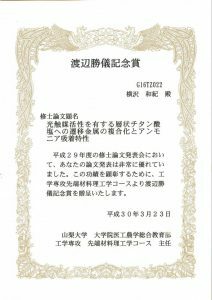 Mr. Kazuki Yokosawa (supervisor : Prof. Takahiro Takei) won Katsuyoshi Watanabe memorial award of the master defence in the Department of Engineering, Advanced Material Science Course held on Feb. 13-14th, 2018. The research topic of Mr. Yokosawa is “Hybridization of Layered Titanium Salt Photocatalyst and Transition Metal and Its Adsorption Property of Ammonia”. Three excellent oral presentations were chosen among 19 presentations.